Last week, I had to spend one night in an airport hotel before flying back home early the next morning. I don’t do that terribly often, not being the jet-setting type. By the time I got into my hotel room, it was late in the evening and I was extremely tired. I had a glance around the room. It was modern and clean and big enough for two, although there was only me. I put down my bag and hung up my jacket and did what I usually do when I end up in a hotel room in the evening. I went to the window and looked out. There wasn’t very much to see. The brightly illuminated car park several storeys below, the red tail lights of the cars on the adjoining motorway, the twinkle in the sky from the queue of planes lining up to land. Not a living soul in sight. Just lights and darkness, darkness and lights. I looked back into the room. I felt over-tired yet restless, not quite knowing what to do. I could go down to the bar but that wasn’t really my style. Besides, I’d been travelling for hours to get this far and I had a very early start. I needed to rest. So, once again, I did what I usually do in these circumstances. I filled the little kettle at the bathroom tap, clicked it on, unwrapped one of the two teabags and laid it in one of the two cups, tag and string hanging over the side and, when the kettle had boiled, I made myself a cup of tea. With UHT milk and water from a bathroom tap, it wasn’t the Rolls Royce of cups of tea, not by a long shot, but, still and all, it was wonderful. As I sipped my tea, I found myself becoming at peace with the space I found myself in. I pulled out the tucked-in bedclothes (I hate those), set the alarm on my phone, and arranged my book on the bedside table. It wasn’t home but it would do for a little while. All thanks to the cup of tea. I think I need to be able to do something for myself in order to know I am someplace where I am welcome and where I, at least temporarily, belong. I don’t think I’m alone in this. The simple act of making a brew was enough to add my own tiny contribution to the standardised commercial preparedness of that room. It made me feel okay. And that was it. I would have never thought there was anything to be blog-posting about in that tiny occurrence. Until I came back home. I was listening to the radio on the day I came back and there was a lady on there speaking very passionately and very lucidly about her situation. She is running for Local Government somewhere in the Country and she is an Asylum Seeker who has lived for over nine years in Ireland’s Direct Provision system. The Direct Provision system was established in 2000 to house asylum-seekers entering the Irish State in search of international protection. It was initially described as an interim system which would provide accommodation for a six-month period while people awaited an outcome on their application. Like I said, this lady had been in the system for nine years and is still there. She said lots of interesting and clearly genuine things in her interview and I wish her well in the upcoming election. I feel she would be a strong addition to local politics in our country. But one thing in particular stayed with me from her interview and you’ll soon see why. Paraphrasing like mad here, she was asked was she able to cook her own meals in the government facility in which she was being accommodated. She confirmed that she was not, that all her meals were provided for her and her family. And that’s when my heart really went out to her and to all the thousands of people who live in similar circumstances, while their doubtless complicated applications are being processed. I thought back to my meagre self-made cup of tea and how it had welcomed me and made me feel that I had staked some tiny claim on the place where I now found myself. I thought how much longer that single night might have been for me if I had not had the ability to provide for myself in that simplest of ways. And then I multiplied that feeling by a thousand, several times over. A thousand nights, a thousand people, a thousand meals not prepared with their own hands. I don’t pretend to be smart or to understand the intricacies of the world. I only really know what goes on inside my own head, and really only some of that. I do know that the ability to prepare some food for yourself and for your family is food itself. It is sustenance for your heart and for your soul. I know that the absence of that is something that could only ever make your day, and your life, and the country you find yourself in, a lot bleaker and a lot less welcoming than it needs to be. If only for a day or two a week, if that woman could cook something for herself and her family, how much shorter would the night be for them? How much easier might they sleep? Quite a lot shorter, I think. You paint the scene quite beautifully with only the merest of descriptions so that we, the readers, can fill it in ourselves and actually feel it. Then you contrast it vividly so we can really feel the difference in that other situation. That's quite a skill you have there. This reminded me of my childhood. Most kids when you think about it don't have much say in what they have to eat or when. They arrive at the appointed place at the prescribed time and pray, in my case at least, it wasn't sprouts or cabbage. I longed for the time I had my own place and could do (and eat) what I wanted. My mum and I fell out when I finally got a flat down the road. She wanted a key so she could drop off "things" for me as she was passing. I knew exactly how often she'd end up passing and there was no way I was having that. Remember in my novel The More Things Change Jim goes to the park to dispose of come crusty rolls, well that was me. When I was living in East Kilbride every time my parents came a-calling there was my mother clutching a bag of crusty rolls which she was clearly convinced the local bakeries were unable to produce to the standard of her branch of Tesco. I mean, yes, I did used to like crusty rolls but I haven't voluntarily bought any in over twenty years. They told me you could have too much of a good thing and they were right. Freedom is an odd thing. How many of us are truly free? Would we even want to be? 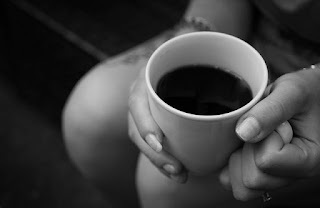 Most of us settle on the few things that're most important to us, to have a pee whenever the mood takes us or scratch our arses or have as many cups of coffee in a day as we fancy. Actually I detest those hotel rooms you describe with their two bags of tea simply because there're only the two bags and then what? What if you fancy a third? I think that's one of the main reasons I'm not a holiday person. I treasure my home comforts. And now enough of this. Time for a cup of real coffee. Just because I can.